(Al Hartmann | The Salt Lake Tribune) At 106 acres, Pando is the largest known aspen clone, and the most massive living thing known on earth. Its trees are united by a single root system. The Pando aspen grove near Fish Lake in Sevier County is the largest aspen clone — and the most massive single living thing — known on Earth. Scientists say the clone could die soon because deer are eating all of its new sprouts, preventing it from regenerating. The grove, which is united by a single root system, is deteriorating — right as interest in Pando is spreading. It has gotten increasing media attention in the past couple of years, and staff at the Fish Lake Lodge say more and more international tourists are asking about visiting it. 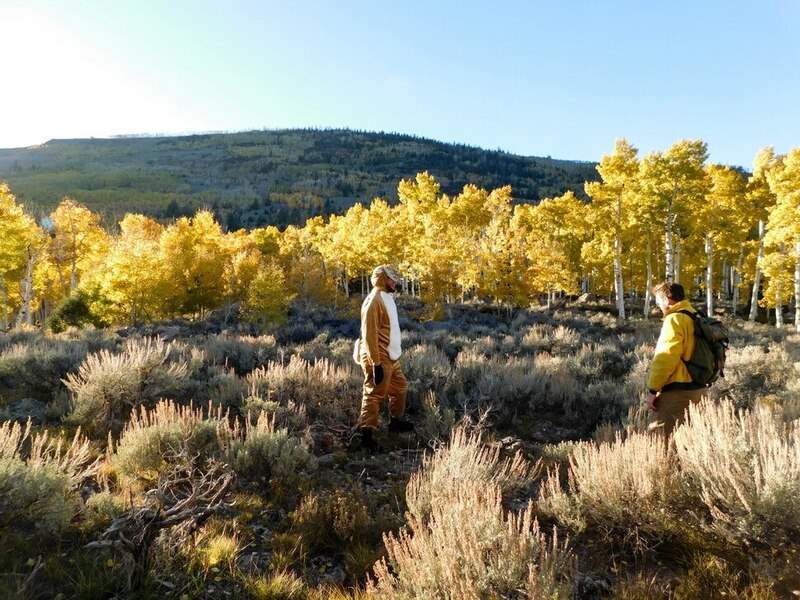 Pando isn’t a single sight to see, and planning a tourist experience of an ecological phenomenon that covers 106 acres can feel like … well, sort of an abstraction. Most of the recreation infrastructure around it is not developed around the goal of “seeing Pando.” There is no marker to tell you where Pando begins or where it ends, and it is not obviously distinguishable from the many other aspen stands around Fish Lake. Here are some ideas for visitors to enjoy their trip to Pando. State Road 25 cuts through Pando as the highway approaches Fish Lake, but the boundaries aren’t marked. Pando begins just southwest of the Fishlake National Forest sign near mile marker 6. Traveling northeast toward Fish Lake, you’ll leave Pando’s boundaries about 0.6 mile from the sign. There are dirt roads into Pando on the east (downhill) side of the highway at the pullout with the Fishlake National Forest sign. One of the roads is blocked with a locked gate, but the other, Forest Road 1483, winds about a quarter mile down to Pando’s east edge on the valley floor and continues well beyond that. Passenger cars might be seen on this road, but four-wheel drive and decent clearance are recommended. There aren’t formal hiking trails to see Pando, but you are free to explore. The terrain of Pando is quite steep uphill of S.R. 25 (to the northwest), so most visitors park near the National Forest sign and wander the grove southeast of the highway. You can walk on F.R. 1483 or just traipse among the trees. There some fenced-in areas, but there are gates for public access. One fenced area is on the northwest side of the highway; the gate is immediately across from the National Forest sign. Another fenced area is on the southeast side of the highway, north of the National Forest sign; the gate is downhill from the road along the northeast fence line. Pando is loveliest in summer and fall. 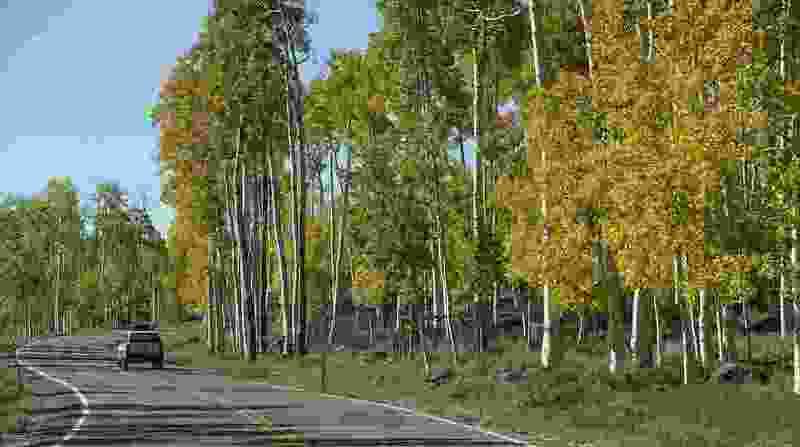 Fall colors in Pando peaked this year during the first week in October — though it can happen earlier, says Fishlake National Forest spokesman John Zapell. The end of September and the beginning of October are generally the best times to visit. The light is best late in the day, especially when the leaves are turning yellow. You can see Pando from across Fish Lake at overlooks on the south slopes of Mytoge Mountain. To drive there, take Mytoge Mountain Road at the signed turnoff 1.25 miles southwest of the National Forest sign in Pando. The road, also known as Forest Road 046, continues up to overlooks via short spurs at Forest Road 059 and Forest Road 046 N. From the lookouts you can see Pando to the west, across the lake. Mytoge Mountain Road was well graded and would be passable for passenger cars up to these lookouts as long as conditions are dry. You also can hike up to the F.R. 046 N overlook via the Lakeshore National Recreation Trail, which circles Fish Lake. The section from Pando to the overlook is described in this hike guide. Fish Lake is well developed for recreation, with trails, fishing, boat rentals, picnic areas, dining and lodging nearby. Some amenities aren’t available year round. For more information, visit the National Forest website at www.fs.usda.gov/fishlake or for private services visit www.fishlakeresorts.com and boweryhaven.com.